Question asked in Proverb 31:10: “Who can find a virtuous woman”? 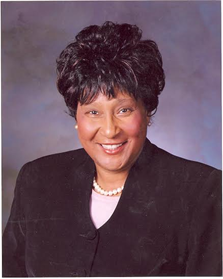 Our “Spotlight” this month is focused on a virtuous woman, Gloria Hollinshed Reid. Our honoree is known by many titles and the most common one is Sister Reid. Gloria Reid was born on June the 9th in Fort Valley, Georgia. She was joined in holy matrimony to the late Willie Louis Reid (Founder and Pastor of Fellowship Bible Baptist Church). Their marriage covered over 38 years and from that union, three wonderful children were born; a daughter, Lorea Reid; a son, Willie Reid, Jr. and their youngest child, Ryan Reid. Ryan and his wife Sharol recently added to the family tree with the birth of their son, Ryan, Jr., thus adding the title of grandmother to Sister Reid’s titles. Sister Reid has some very strong ties to Fellowship Bible Baptist Church. She is the co-founder with Pastor Willie Reid. She stated that she remembers as if it were yesterday, going to that small, one-room storefront to clean the 30 chairs that were set up for their first worship service. They were so excited and had faith to trust God and follow His orders. Their ministry started with children that she had taught and one or two adults. They would encourage each one to reach one. The children eventually brought their parents, and they made personal calls to their unsaved/unchurched friends. Soon, they received their first member, Sister Ann Wilcoxson. They knew then that God was encouraging them to continue. Sister Reid stated that there was much opposition because there had not been a new ministry (church) started in the Warner Robins area in years. They were determined to hold on to God’s direction. As a result of their obedience to God, He has blessed Fellowship with many souls for His kingdom. Gloria Reid stated that The first, second, and third lesson that she’s learned in life is to TRUST GOD in ALL aspects of her life. She also stated that there is life in God’s word. If God said He will do something, He’s going to do it. Faith and wavering cannot be mixed together. In addition, learn to forgive and love as God has taught. Sister Reid stated that she would like to be remembered as one who loved God, is willing to share the good news of Jesus wherever she goes and as a person who never showed favoritism to a certain group of people based on status. She also wants to be remembered as one who is not afraid to speak up on behalf of Christ, and a woman who loves her family. Our honoree’s ” message” (words of wisdom) to Generations X, Y and Z:” You cannot expect to succeed without some failure along the way. You must have some goals in life that you would like to achieve. Life is designed for those who are able to pick themselves up after falling down. It’s not going to always be easy. Be prepared for opposition. You will get out of life what you put in. Follow the rules, obey your parents and the law, and pursue your passion. Co-founder’s message” to Fellowship: Keep your eyes on Jesus. God has appointed Pastor Morgan here to shepherd the flock. We MUST follow our pastor as he follows Christ. God loved the church so much that he sent His son Jesus to die for it. Church matters are very serious and cannot be taken lightly. As you matriculate in various ministries, and as you make decisions regarding God’s business make sure that you pray fervently seeking His guidance for an answer. Make sure that you give God a tenth of your income so that you can be blessed as the scripture has promised. Don’t hesitate, just do it!